A vertical garden tower allows you to garden vertically, thus saving space on your patio or in your back yard. 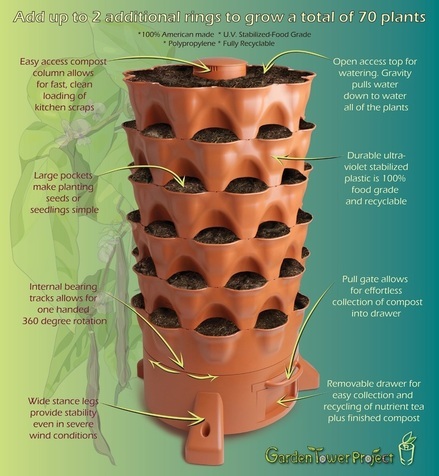 The Garden Tower pot holds up to 50 plants and takes up approximately 4 square feet of space. 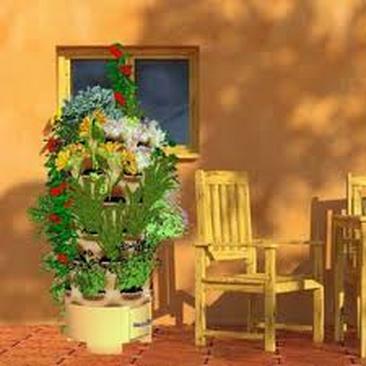 You can easily grow just about any flower, herb or vegetable plant in these garden towers. Eat food you grow yourself, thus ensuring healthier food for you and your family, that is free of pesticides, waxes, and so on. There's an easy access compost column in some Garden Towers that goes down the middle of pot, and you can put kitchen scraps in it, and it will turn the scraps into fertilizer for your plants (with the help of compost worms (sold below)! Organic waste to organic food! There's a small pull gate at the bottom of the pot for effortless collection of compost into a drawer, and for easy disposal of the compost. You water your plants from the top, and gravity pulls the water down to all of the lower plants, as well. The Premium 50 Gallon Rain Barrel Kit featured below allows you to collect rain water for watering your plants (sold separately). The large pockets around the Garden Tower pot make planting seeds easy. Simply put a seed into the soil in each space, water them, and wait for your beautiful flowers to blossom, or for your herbs or vegetables to grow. These gardens can easily be turned 360 degrees with one hand, too, so you can make sure your plants are all getting adequate sunlight for optimal growth! Easy Access Compost Column with Removable Drawer for easy collection and recycling of compost. Large pockets make planting seeds or seedlings simple. Open Access Top for watering your plants. Made of Durable ultra-violet stabilized plastic that is 100% food grade and recyclable. Internal Bearing Tracks allows for one-handed 360 degree rotation. Wide Stance Legs provide stability even in severe wind conditions. The Garden Tower takes up about 4 sq. ft. of space, so it takes up minimal space in your backyard or on your patio. You might want to have 2 or more in a row, and grow a variety of things. One could be for vegetables, one for flowers, one for herbs, and so on. Or use one for green vegetables, and one for yellow vegetables. Or perhaps one strictly for tomatoes, and one for green beans. There's so much you can do with these planters. 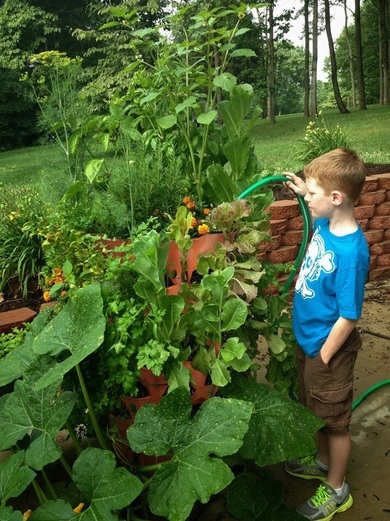 The Garden Tower allows for the abundant growth of 50 plants vertically in a minimal footprint and eliminates weeding making gardening simple and more enjoyable for the entire family. Here are some accessories to help you get your Garden Tower up and running quickly and easily. From composting worms to fertilizer, and seeds. Get them all today, so you'll be ready to grow! The video above shows the Kickstarter video for The Garden Tower Project before it became available to the public. We think you'll enjoy seeing it from the beginning, and why the owners felt the need to create this product. Eat healthier when you grow your own food! It's as simple as that! Perhaps you want or need smaller vertical pots for specific plants both indoors or outdoors. The ones below will give you some great options, and you can garden with ease while taking up minimal space in the gardening area you choose. They are lovely on a patio, indoor/outdoor porch, etc.